It was good to know I was not suffering alone. A few days later, a lovely new pair of tortoise shell Kingfishers arrived over the transom. Hmmm. Nice. Just as advertised, the thin and flexible “Resilamide” earpieces (an expensive aerospace polymer) slid in between the Schuberth and my skull as comfortably as a tapeworm through a chihuahua, and wearing them both around the house for a couple hours resulted in no pain or hot spots of any kind. Another benefit of the flexibility of these is that they feel like you’d have to work hard to break them. 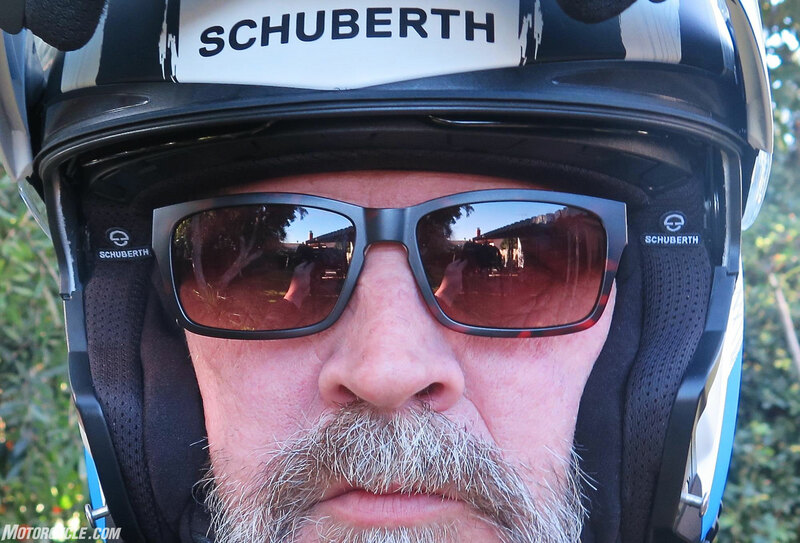 They’re also really light, and with a padded nosepiece that has them perched atop your face more comfortably than typical sunglasses. 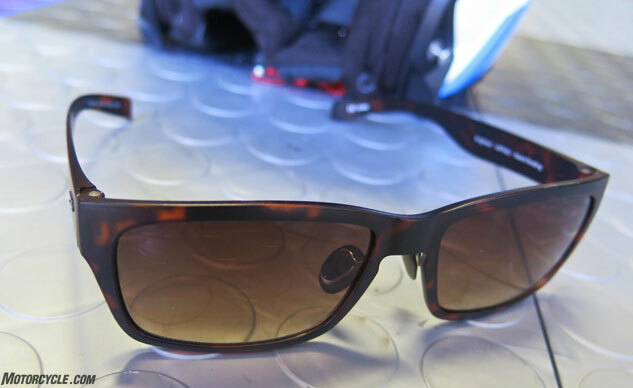 Stock Kingfishers come with impact-resistant polycarbonate lenses, and all kinds of prescription ones are also available for a few dollars more. Those earpiece arms slide in like a Rolls-Royce dipstick. If I were more fashionable, I could’ve had those frames in Satin Blue or White (or Glossy Black), with standard lenses available in Gradient Copper, Mirrored Sapphire or Gradient Gray Tint. My Kingfishers are but one of eight different styles offered. Prices range from $154 (Kingfishers), to $189 for a pair of Hawk non-prescription bifocals, and on up to around $500 for a full prescription pair of glasses; send your prescription along to Flying Eyes, and they’ll take care of the rest, using state-of-the art prescription labs. Seems like a small price to pay to properly respect one’s temples.